PartyMojo now offers Kacang Puteh for your event! The Kacang Puteh rental includes delivery and collection of stall, setup, dismantle and not forgetting, PartyMojo’s professional staff to serve you the Kachang Putehs in the paper cones! 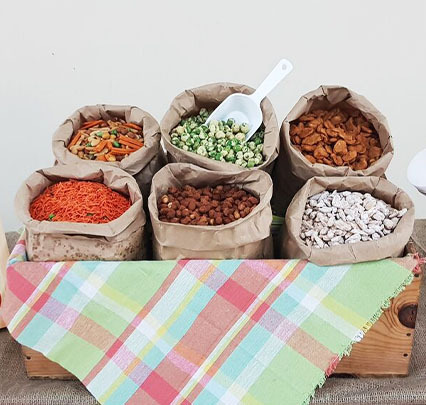 The flavours available are Mixed Murukku, Coated Green Pea, Cracker Peanut, Sugar Coated Peanut, Mixed Nut and Curry Broad Bean! All we need from you is a table and nothing else! – Delicious and crunchy Kacang Puteh nuts! Holding a large scale event and not sure how many machines or how long a duration you need? Fret not because PartyMojo is here for you! With over 50 in-house machines and food stations, a big team of Mojo staffs, let us share your burden. We do provide a huge discount for long hours, so why not enquire with us today! Scroll down to see a video of how kacang puteh is served! What is required from me if I hire kacang Puteh from PartyMojo? A small table is required from the client for our set up. How many kind of nuts are provided? We provide 6 types of nuts! Mixed Murukku, Coated Green Pea, Cracker Peanut, Sugar Coated Peanut, Mixed Nut and Curry Broad Bean. Yes! All prices as above include delivery, set up, man power! Not only that, young and lively staff will be at your event to serve and punctuality is guaranteed! Not only that, you can even top up $50 to get our manpower to be dressed in indian traditional costume to serve the nuts! Are the Kacang Puteh Halal? Yes absolutely! All our ingredients are Halal! Do I have to prepare a table for PartyMojo to place the Kacang Puteh? Yes, we will require a table to place the Kacang Puteh! Otherwise, tables are available for hire at only $20. My event is outdoors, can I still hire? Yes! PartyMojo can go everywhere and anywhere in Singapore! However for inaccessible locations like Sentosa, Tuas South and so on, a transport surcharge between $30 is applicable. We have a company event and we need more than 2 hours for 1000 pax, what are the charges? For large scale events, do enquire with us for a quotation and we will be sure to reply you within a day! Are there any discounts for longer period of rental or if we decide to add this into other packages? Yes!!! The more you order, the more discount you get! Contact us for discounted rates today! 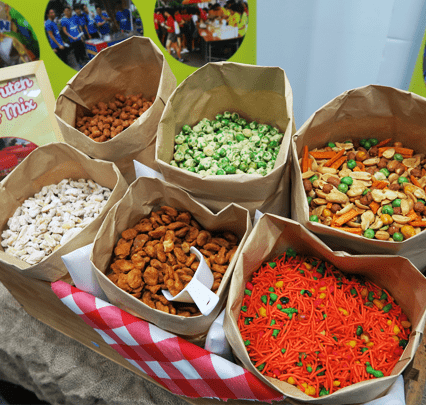 “How will the Live Food Station turn out during my event?” Check out our video and see it for yourself! Please note that tables are not included. If you do not have an extra table, let our friendly event advisors know! We provide table rental at $20 each.